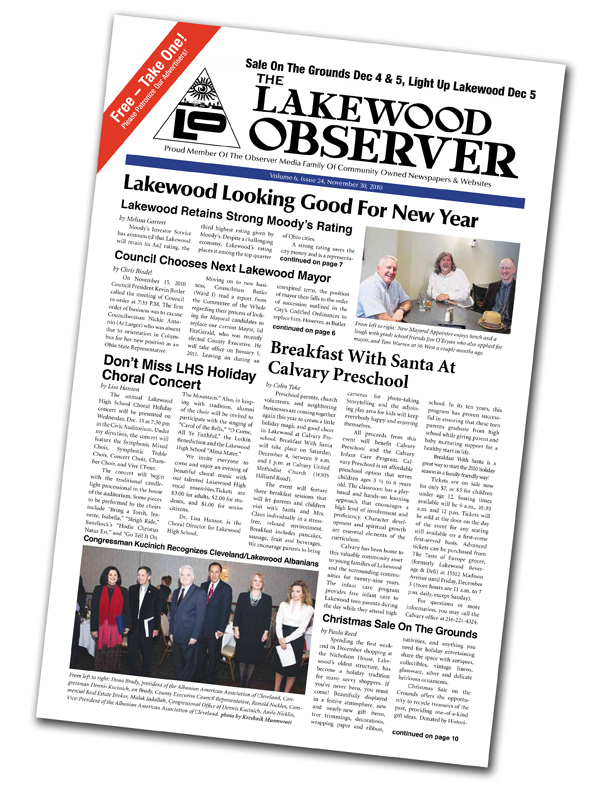 This is the Lakewood Observer Volume 6, Issue 24. It is filled with fun things to do in Lakewood during the coming weeks of this wonderful holiday season. Looks like Santa has taken up residence in Lakewood for all of the appearances he is making in and around town! From the always enjoyable "Breakfast with Santa" at Calvary on Hillard, to Santa at the Library for Light Up Lakewood, and who can blame him. We know he needs a "cool place" to hang out in when not at the North Pole!. Speaking of Lakewood classics. Let's give a tip of the hat to all of the great volunteers over at Lakewood Alive for putting on Light Up Lakewood, where I hope to see you somewhere along the street, and/or at Sale On The Grounds at the Nicholson House where one can find unique cool gifts, while helping the Lakewood's fabulous Historical Society (Gift tip, Historical Society Memberships makes great gifts). This LO and every Observer is truly a labor of love from everyone on the staff, to everyone that has ever contributed, to those that advertise to our friends that support our advertisers and support buying local. Together all of us bound with our love for Lakewood and what we have here right now, are looking forward to 2011 and beyond. Because we all know... No matter how tough it might get, we have chosen the right town to make our lives and our stand, and that living and working together here is better than anywhere else. Before I sign off, let me throw out a little PSA for something that is near and dear to my heart. This season, while joyous for some, also represents some of the toughest months of the year for others. Sadly, many of the things that make you and I happy, will underline to others just how tough life is. Humans are complex beings. While some are madly in love celebrating their engagement, anniversary, or friendships, others have gone through divorce, separations, or loss of a loved one or friend. For every present you buy remember, there are others just looking to survive on what they can pull together. In the end we are all neighbors, and good neighbors watch out for their neighbors. Now is the time of year a call, a simple email, or visit can make all the difference in a person's life who is depressed during the holidays. Reach out, share your love, your compassion, your friendship. It does make a difference and costs so little. PLEASE SUPPORT THOSE CHARITIES THAT HELP THOSE LESS FORTUNATE THIS HOLIDAY SEASON. Now relax, enjoy this holiday season. It will bring memories that will last a lifetime.